NANJING, China — On Sept. 15, 2014, students from the People’s Republic of China, the Republic of Korea, Europe, and the United States converged on the Johns Hopkins University–Nanjing University’s Center for Chinese and American Studies, more commonly known as the “Hopkins–Nanjing Center” (HNC), to begin orientation week for the 2014-2015 academic year. Between Sept. 15 and Sept. 19, the new students of HNC spent their days listening to presentations from the Public Security Bureau, the local foreign medical clinic, and from Chinese and international faculty. In addition, students learned about the resources available to them while forging new relationships and learning about the place many will call home for the next one to two years. “Although there were many important aspects covered in orientation, such as how to navigate the library and choose our courses, the biggest takeaway was getting to know the people at the Center,” said Ashley Johnson, an HNC-SAIS five-semester student from Texas. During orientation, students met with distinguished faculty and learned about the different areas of study available at HNC including international politics; energy, resources and environment; comparative and international law; and Chinese studies. Students listened to in-depth descriptions of courses offered within these departments, such as Chinese Government and Politics; Chinese Constitution; Economic Principles; Global Energy Fundamentals; Politics of Rural Development; and Economics of Strategy. With some courses taught in Mandarin and others in English, international and Chinese Students alike will have the opportunity not only to improve their target language skills, but also to increase their knowledge within their desired fields of study. “Regarding the most important part of orientation, I felt it was the course descriptions. From this part, we could clearly figure out what we are interested in and what we are going to take for this semester,” said Jewel Qu, a Chinese graduate certificate student from Zhengzhou, China. Students also learned about resources available to them including Career Services, writing tutors in both Mandarin and English, a computer lab, fitness facilities, academic databases, and an exceptional library. 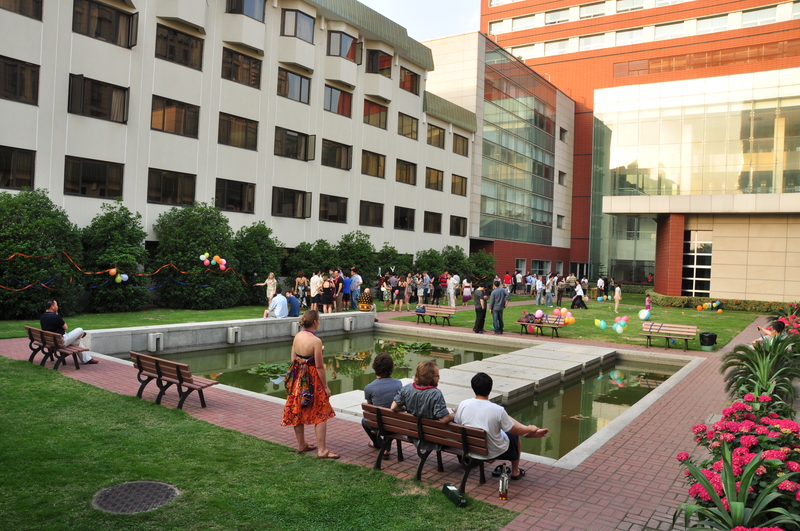 Located in the Samuel Pollard Building on the HNC campus, the library is unique in China. Despite its location in a country where some information is restricted, the HNC library provides students with academic freedom within the campus confines. These resources will help ensure that students are well prepared to follow a strong cohort of alumni working across the private, public, and non-governmental sectors. “In my opinion, the Hopkins-Nanjing Center is small but beautiful and well equipped with all the things that students need,” Qu said. The majority of the students coming to the Center have never lived with an individual from another culture, a fact which is about to change as the Center pairs each international student with a Chinese roommate. This experience provides students the opportunity to learn about another culture and use their language skills on a daily basis. Having a roommate whose mother tongue is the language one will be studying is an invaluable asset and is arguably one of the greatest resources that students have here. Despite this, many students were acutely aware of the challenges this year will entail in terms of language requirements. Even though all met the language requirement, determined by a proficiency exam, some parts of orientation still proved to be challenging. “The potential for growth at the Hopkins–Nanjing Center seems exponential. Academically, we have access to some of the best resources and professors in the field of international relations… Personally, I look forward to reaching a high level of Chinese proficiency, forming new relationships, and gaining further insight to a fascinating culture,” Johnson said. Overall, the Hopkins–Nanjing Center is truly a one-of-a-kind institution representing a joint venture between educational institutions from the United States of America and the People’s Republic of China, aiming to train the leaders of tomorrow. This academic year will prove to be a life-changing event for many, offering new experiences including the challenge of contextual courses in a foreign language, academically free classrooms, and cross-cultural living.